WordPress is the largest CMS in the world, powering ~1/3 of all websites. The WordPress editing experience hasn't changed much in over a decade and Gutenberg now aims to completely reinvent it. That's a big deal. It won't be easy, but here's 1) why it's worth it and 2) what it means for page builders. The WordPress ecosystem has been trying to improve the site editing experience since before plugins entered core in WordPress 1.2 (2004). There have been page builders, theme frameworks, front-end editors, etc. all trying to improve the WordPress experience. Like every meaningful advancement, there are these wild west days of churn to find something that works. There have been a lot of great tools and learnings, but there has also been a lot of fragmentation across dozens of page builders, theme frameworks, etc. that don’t work well together. If you’ve been around WordPress for a while you’ve seen some cringe-worthy examples of this. For example, a site with a bloated “multipurpose” theme…using a page builder…and using WooCommerce or some similar monstrosity. It’s a mess. Why do we have page builders, theme frameworks, shortcodes, custom post types, and more? All to fill the gap between what WordPress core does and what users want. The WordPress ecosystem is built around a broken system with bloated themes, widgets, shortcodes, custom post types, menu items, page builders, etc. These DO NOT exist because they’re the best way to build a website. They DO exist because they’re compensating for WordPress’s shortcomings in fulfilling users' needs. Gutenberg aims to standardize and add these foundational elements that WordPress lacks. While experienced users may be used to this (like you get used to a bad knee and don’t notice limping), it’s a bad experience for new users and it’s holding WordPress back. This is why WordPress needs Gutenberg. 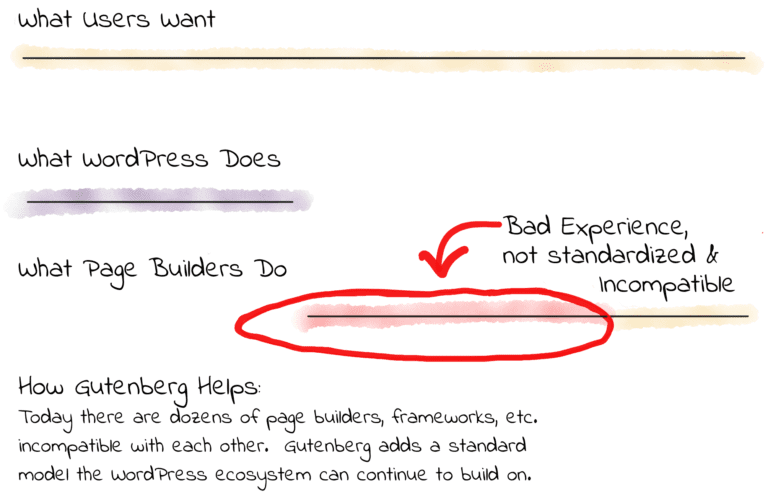 Will Gutenberg Kill Page Builders? This is a question I see asked a lot. The answer is yes, but not how you think. 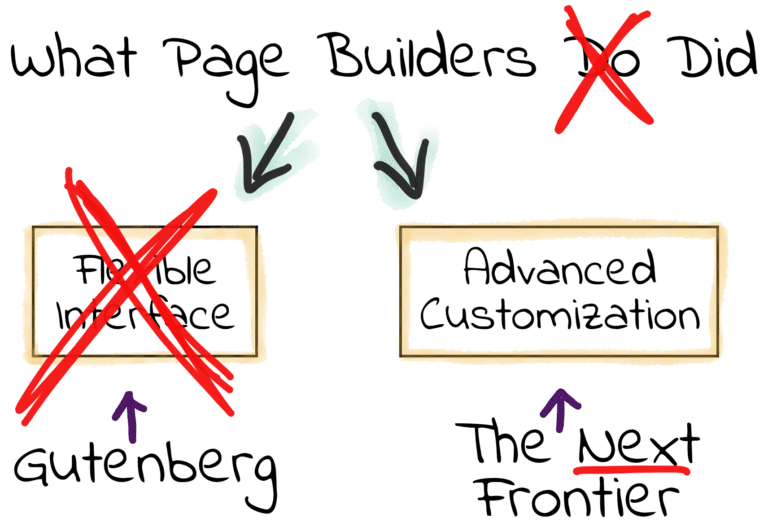 TL;DR “page builder” is a description of “how” page builders work, not “what” page builders do from a jobs-to-be-done (JTBD) perspective. There will always be a market for the what. It’s only the how that’s changing. For example, page builders provide a flexible interface (modules, drag & drop, etc.) that gives customers advanced customization beyond WordPress core. The flexible interface is only relevant because it enables the customization. The customization is what customers want. Page builders had to provide a flexible interface in order to provide customization. Gutenberg is changing this. To reiterate, the only reason page builders provided the interface (via their own frameworks) was because WordPress didn’t. They had to provide the interface in order to give users what they want. In a sense, Gutenberg frees page builders to focus on what customers actually pay them for: advanced customization beyond what WordPress core does (or will ever do). Over the next few years as Gutenberg develops we’ll see page builders migrate from their old (own) frameworks to Gutenberg and evolve from page builders into customizers. This should provide a major advantage as they can redeploy resources from maintaining (and supporting) their own frameworks to focus on building the best customization experience in innovative ways. Gutenberg allows page builders to focus on what customers actually pay for: advanced customization beyond what WordPress core offers. Gutenberg will be in 100% of WordPress installs 5.0 and later–far that more any page builder today. A more flexible, easier to use core editing experience will only accelerate WordPress growth, meaning a larger TAM (total addressable market) for customizers. Customers are divinely discontent. Their expectations will continue to rise as they always have. Only page builders customizers that leverage Gutenberg and focus resources on improving the customization experience will meet these growing expectations. Bloated multipurpose themes will die out as functionality shifts out of themes. There will be thousands of new opportunities to make money with WordPress. The future is bright for those who adapt. There will also be page builders that fail to make the transition. They’ll try to stay relevant by adding “Gutenberg compatibility” with their old page builder frameworks. This is like adding “electric compatibility” to gas-powered vehicles–it misses the point. Perfect reasoning from wrong premises. But we can’t fault page builders for behaving this way. Switching to Gutenberg when you have a paying customer base using your old framework seems counterintuitive. Companies are supposed to leverage their advantages, not destroy them, right? They're sticking to what made them successful in the past, oblivious that it'll doom them in the future. Sometimes you have to disrupt yourself before somebody else does. The hard part is knowing when. This is the classic problem with incumbents. For example, despite being one of the first to mobile, Microsoft was too focused on what made it successful in the past and ported Windows to mobile (made Windows mobile compatible) rather than thinking mobile-first like Apple and Android. Sound familiar? Will this make it so clients don’t need my services? I already have tools and a system that works for me, will this break them? I don’t have time to learn anything new. This just creates more work I don’t get paid for. The plugins and themes I rely on won't work anymore. …and dozens more.These are all reasonable concerns and the uncertainty of not having answers can create fear that manifests as resistance and anger, especially when livelihoods are at stake. The WordPress team could have handled the approach and messaging around Gutenberg better. If existing users (especially WordPress professionals and plugins/theme authors) were brought along better, then Gutenberg would have more community support. But this is very hard work and they’re human. They’re also volunteers dedicating a nontrivial amount of their limited time on this earth to improving a project we all rely on and use for free…so let’s cut them some slack, appreciate their efforts and contribute through constructive criticism. This is what makes WordPress great. The great thing is that the only reason this is happening (people passionate about making WordPress better and people passionate about not ruining it) is because we all care deeply about WordPress. Remember, this is what makes WordPress great! Let's get through it together. Gutenberg still has a long way to go to earn the confidence of the community and it’ll take more than just polishing the experience. It'll take listening to the community, addressing the concerns around Gutenberg like helping existing professionals adapt to the change, ensuring more plugins are compatible, etc. Even hosts should be involved and educating their customer bases. This is a community project and it’ll take the community to make it successful. When it is, we’ll all have more of the growing WordPress pie. Here's to 50% and the next 15 years.? We all hear that Gutenberg is “the future of WordPress” but what does that mean? When you've been using the same theme, page builder, framework, etc. for years and it still seems to be working fine, it can be hard to think about switching to Gutenberg. In essence, it just feels like a lot of work and risk with little value if you're a user or work that you won't get paid for if you do it for clients. For context, here's a quick reminder on how to think about Gutenberg (see the long version here). First, WordPress does basic things that most users want: pages, posts, user management, etc. Plugins and themes add a flexible layer of customization that fill the gap between what WordPress does and what users want. To use an example that's most relevant to Gutenberg, let's talk about page builders. Page builders are a type of plugin that adds a flexible interface for advanced customization that's easier and faster than building a custom theme, using custom post types, etc. Unfortunately, there are dozens of page builders and multipurpose themes with built-in page builders, which makes for a lot of complexity, bloat and incompatibility. Let's think about page builders today: “page builder” is a description of “how” page builders work, not “what” page builders do. 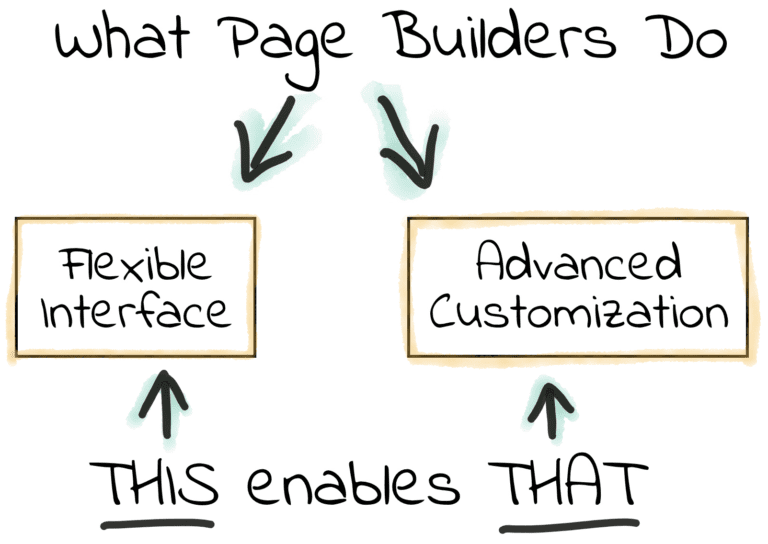 For example, page builders provide a flexible interface (modules, drag & drop, etc.) that gives users an advanced layer customization beyond what WordPress natively provides. The flexible interface is only relevant because it enables the customization–the customization is what users want. The only reason page builders provided the interface (via their own frameworks) pre-Gutenberg was because WordPress didn’t. They had to provide the interface in order to give users the advanced customization they wanted. But now, this new Gutenberg block model natively provides this flexible interface. This is WordPress's new foundation, upon which everything else will be built. So, to continue getting the most out of WordPress you'll want to start using Gutenberg when it works for you, which gets us to the question…. How & When Should I Switch to Gutenberg? The most important thing to remember is that there's no rush to start using Gutenberg. You should switch at some point, but it isn't urgent. Why? Because Gutenberg is still in its early days. For example, in Gutenberg Phase 2 sidebars, footers and menus will also get Gutenberg-ized (blockified? ), which will be another fundamental shift. If you're nervous about switching to Gutenberg, we recommend waiting until at least the fundamental phases are done. Ok, But How Do I Know When to Switch? Ok, ok, I'll get to the point. When to switch is different for each person, so we recommend using the Gutenberg Challenge. Try writing a blog post with Gutenberg. Try writing or updating a complex page with Gutenberg (e.g. homepage, landing pages, etc.). Try your next simple website project or rebuild with Gutenberg. 2To save time, use the recommended free set of components (theme and plugins) we recommend below. 3Once Gutenberg meets your needs, start using it exclusively for blog posts and simple pages. 4When Gutenberg meets your needs for complex pages (e.g home page, landing pages, etc. ), try using Gutenberg for your next full project or rebuild. 5If Gutenberg doesn't yet meet your needs, please share feedback on what's missing in the Gutenberg Challenge feedback form. We'll share this feedback with the WordPress core team and use it to improve our recommendations here. That's it! Think of it as an investment in building familiarity with Gutenberg to continuously improve your skill set and keep your skill set relevant until you switch to Gutenberg. 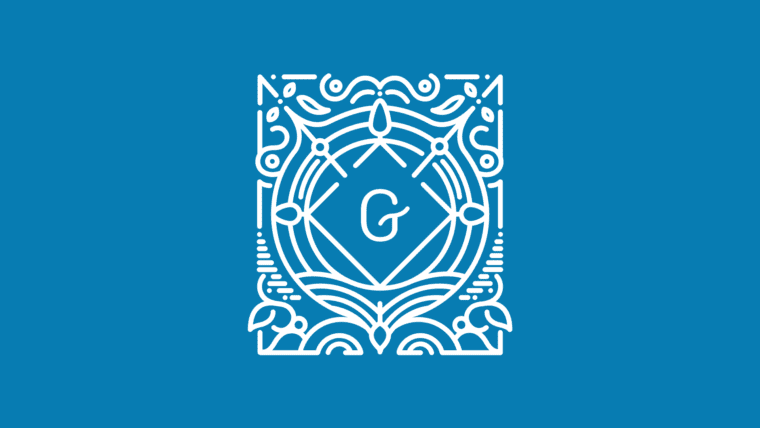 If you're interested in taking the Gutenberg Challenge we set up a dedicated site for it here. Not only is the site built 100% with Gutenberg, but we've included the recommended components to get you started fast! As the WordPress freelance market continues to grow it also continues to get more competitive, so we’re always looking for new ways to consistently generate quality leads. From coworking spaces to Upwork and online classifieds, this post gives you 5 new ways to generate leads for your freelance WordPress web design business. If you’ve been a WordPress freelancer for a while then you probably already know that how a client project begins is a pretty good indicator of how it will end up. A questionnaire is your secret weapon to ensure you ask the right question every time and your client gives you everything you need to exceed their expectations. Here's how to create the ultimate WordPress client project questionnaire. The average small business has a poor experience having their business website built on WordPress. As WordPress professionals, this is a failure on our part. If, as a community of WordPress professionals, we can align on the kind of consistent, quality experience we want to give out clients (the one they deserve), we’ll raise the bar in the WordPress ecosystem and our rates will raise accordingly. Are you having trouble closing leads? Changing how you follow-up with prospective clients could help. Many freelancers follow up in a way that seems desperate, which could be a turn-off to prospective clients. Instead, try following up in a way that builds authority, positions you as an expert and builds a relationship. As entrepreneurs (and especially as developers) we frequently undervalue our products and services. This not only leaves money on the table, but it’s also bad for your customers. Undercharging jeopardizes the future of the product or service they depend on. Paying what it’s worth supports the ongoing maintenance and development of the product. One way to fix this is with value-based pricing. For a website creation and designing business, one of the most important things you can do is make it clear to your potential clients that your services provide a positive return on investment. This isn’t just limited to building the site initially. If you can convince a client to pay you to continually upkeep the site, the recurring income will provide you with a good bit of stability and freedom in your work. WordPress agencies and freelancers typically live on a constant stream of clients. Finish one job, get paid, and move onto the next. This can function as a steady income stream, but the constant need for more work limits the flexibility that many people are looking for from this kind of job. The ideal solution for many is recurring income. When you own a WordPress plugin or theme business, the big challenge is getting enough people to pay for it. This is where free trials come in. Free trials come in many forms, but if done right they can boost conversions. This article goes in-depth into all the options, advantages, and considerations, covering everything you need to know about free trials for a WordPress plugin or theme business. Are renewal discounts right for your WordPress theme or plugin business? Learn the ins and outs, and dos and don’ts, of renewal discounts for WordPress themes and plugins to make an informed decision on whether to offer these types of deals to your own customers. Should You Sell Premium WordPress Themes on ThemeForest? Have you ever created a premium WordPress theme? If so, a big consideration is where to sell it. You could sell it yourself or you could post it to one of the existing theme marketplaces. Here's we'll help you evaluate whether ThemeForest, the largest WordPress theme marketplace, is right for your premium WordPress theme business. Life as a freelancer has ups and downs with income. You may be used to it, but it poses risks to the long-term health of your WordPress business. Level out your income by diversifying the ways you generate revenue–it's easier than you think. Freelancing is great because you’re in control, work your own hours and can work from wherever you want. But to be financially successful as a WordPress freelancer you have to charge rates that support your financial goals.Here are 10 tops for increasing your rates as a WordPress freelancer. This guide focuses on getting more leads, growing referrals and streamlining how you get new clients–which will be one of the most important parts of sustaining and growing your business. There’s plenty of WordPress work to go around, but the best jobs are competitive–this guide will give you the edge you need to make it rain! The hardest part about life as a WordPress freelancers is consistently generating quality leads. If you’re new to freelancing how do you first get that leads flywheel going over the first few years? Here are 25 ways to generate qualified leads that you can start doing today. Productized services are a relatively new path for WordPress freelancers who are tired of client. Not only is it more scalable, but if done right it can also be a lot more profitable. Learn how. Productized services offer new opportunities for WordPress professionals. They can be offered as add-on services or standalone services. This article offers 3 examples of productized consulting services that WordPress professionals can add to their offerings. If the last two articles have piqued your interest in productized services and you want to learn more about how to get started, then read on. This 7-step guide will teach you how to productize your WordPress business. WordPress powers around 1/3 of websites worldwide and has a thriving community of fans. Maybe you blog with WordPress, use it for your soccer team or church group. You’re familiar with WordPress and now you want to know if you can make a living with it. The answer is a resounding YES! Not sure what WordPress Product to build? Read this! If you want to create a startup, or launch a business creating products, it can be hard to narrow your options. Even when you have a good idea of what you want to do, creating WordPress products, for instance, you’re still left with a lot of choices. Here's how to decide what to build. WordPress is huge, as are the opportunities it can provide you. If you enjoy working with WordPress and want to make a living from it there are numerous ways you can go about it. Here are 21 ways to make money with WordPress, many of which don't require knowing how to code. Katie Keith joins us to share the story of Barn2Media's successful transition from designing WordPress websites to selling WordPress plugins. Pippin runs one of the most successful WordPress plugin businesses and is one of the most earnest, effective and transparent business owners in our WordPress community. If you run (or aspire to run) a WordPress plugin or theme business I highly recommend you read each one of his year in review posts–they're full of excellent insight. IconicWP, a WooCommerce plugin shop, started out selling on Envato but then transitioned to Freemius. After switching to Freemius they doubled their WordPress plugin revenue in under a year. Learn more about how they did it to see if you can apply these lessons to your business. Most WordPress professionals serve individuals and small business, but there’s another customer that’s willing to pay you more: Enterprises. If you can earn their trust and meet their needs, you may have what it takes to land your first enterprise customer. Here’s a real-life example of how to start making $1,000 a month with WordPress in less than 90 days, even with a full-time job. Even if you choose to monetize your skills in a different way, this post has invaluable advice on how to get started. WHM provides a powerful way not only to create and manage your clients hosting accounts, but also to brand each individual cPanel with your own business logo and color scheme. In this post, we’ll walk through using WHM to create hosting packages and individual accounts, and branding your clients’ cPanel accounts. Selling music and other audio online is easier than it has ever been. Sell songs, lectures, samples, audiobooks, lessons and more with various business models like memberships, licenses, individual files or as a service. This is one of the best guides we’ve found on how to sell audio and music online with WordPress. You build WordPress websites for clients, so why not also host them to add recurring revenue to your cashflow? Recurring revenue from offering reseller hosting creates more predictable cashflow to level out the ebbs and flows of client work. Learn how to add reseller hosting to your business. WordPress professionals typically offer services to clients that are high value, but low scale. Productized services add constraints and narrow focus to systemize the process and consistently deliver it as a packaged service. Learn how the author got to $15,000/month in recurring revenue after only two months and shows how you can do the same. Here are 10 examples of productized services you can start offering to increase your income. The author discusses how the productized service he created now generates $34,000/month in recurring revenue and is still going strong. Are Freemium Plugins Better than Free Plugins in WordPress? Taking into consideration years prior to 2013 as a reference we can see that on average 50%-60% of “freemium” plugins have been updated in 2015 or 2016. This is a significant difference compared to the findings of previous analysis I did on the WordPress repository. The survival rate after 3 years for the average plugin in the repository is around 10%-20%. We are looking at a 200% improvement. To say the theme marketplace is undergoing a transition is probably an understatement. We’ve seen many shops sell or change focus over the past year. A few have maintained their place in the market or even grown some, but it’s not easy work. With so many WordPress themes available on the market, it might sound crazy to even try and start a business selling your own. There are super-huge, multi-purpose themes selling $100k worth a week with option panels the size of their revenue charts, others with big passionate communities supporting them, and countless other shops just as successful in their own right. How can you compete? This week’s guest is Garth Koyle from Event Espresso whose goal is to grow his business into a $100 million dollar revenue company. How do you do this I hear you ask? Well, let's get some hot business and marketing tips from Garth. This interview with Sheila talks about her journey from blogger to entrepreneur. Sheila started as a fashion blogger, but found success when she looked inside, built a community and focused on helping others. See a quick message from Sheila below and link to the full interview at the bottom of this post. You can find hundreds of articles on how to make money with a WordPress blog, but most don't deliver. What sets this article apart is that it’s based on lessons learned from a blog that actually makes money. Read on for proven lessons on how to effectively monetize your WordPress blog. There are several things you need in order to make money blogging. Keywords, marketing, SEO optimizations, etc., are all important; but the single most important aspect of running a successful blog is the content. Freelancing is great, but it’s a lot of work. Using the right tools will simplify your workflow and automate redundant processes to help scale your business. This list of tools for WordPress freelancers includes everything from scheduling to storage tools to help your WordPress business scale. Looking to start an web design agency? It helps to learn from the experiences of those who have found success doing it. Here are 8 tips for starting your own agency to get you started right. Sometimes life as a WordPress freelancer can be feast or famine. Adding different revenue streams to diversify your income not only helps level out your cashflow, but it also give you more options to reduce burnout. Here are 24 ways to do it. WordPress Architect Mario Peshev shares his wisdom on starting a web development business. We cover everything from advice for those who want to start a web development company, to the tools, education, and experience needed to become a developer. Why should prospective clients hire your WordPress agency? That question seems to be getting harder these days, but there are some things you can do to stand out and land more clients. One of the most common questions we hear is “How do I generate recurring revenue for my WordPress website business?” Being a freelancer is difficult because you have no consistency in how much you'll make each month. Unfortunately, there is still no magic cure-all for the elusive ‘passive income', but with these tips you can build recurring revenue for stability and long-term success. Adding recurring income to your business is a smart decision in the long-term. One way to do this is to add maintenance plans to your service offerings. And today, we'll show you how to do that. Discover everything you need to know about selling services and taking payment online with WordPress, WooCommerce and Easy Digital Downloads. Learn how to sell one-off services and regular subscriptions with recurring payments. All without any technical know-how! Should You Put Your Plugin or Theme in the WordPress Repository? Is the WordPress plugin repository worth the hassle? If you’re a relatively experienced WordPress plugin developer, you’ve most likely already asked yourself this question – possibly more than once. If you’re a relatively new WordPress plugin developer, you’re probably asking yourself “Wait … why would I not want my plugin in the repository? !” Both questions are valid. Selling WordPress Plugins & Themes: Should You Go Niche? Back in 2010, a developer could release a mass market WordPress theme or plugin and amass thousands of sales within a few months. In today’s market, that sort of success is exceedingly rare, and so, one of the most important decisions product developers must make is whether to go mass market or target a niche. If you want to thrive in the plugin development business, pricing must be at the forefront of your mind. Along with providing stellar plugin features, it is one of the most important aspects of creating a sustainable long-term business. Get it wrong and you’ll constantly be swimming against the tide. A few months ago, I decided to challenge our plugin’s pricing and try the “WordPress way” by removing the monthly subscription. Keeping only the annual and lifetime billing cycles. We ran this pricing experiment for one week and saw a drastic fall in new customers. “Drastic” is an understatement – we lost 54% in our customer acquisition rate. As WordPress professionals, we're always busy. We get stuck in the day-to-day grind of client work, maintaining our plugins and themes, supporting customers, growing sales and more. But to stay at the top of our game we have to continually invest in mastering our craft to learn new (and better) ways to work. To help WordPress professionals improve their skills and learn new ones this year, we're happy to offer all ProfitPress content free for a limited time! Our content consists of in-depth, highly researched, professionally curated content to give you the edge over your competition and grow your business. Educational Tracks: We've organized our content into tracks to help you find relevant content faster. Mark Complete: We've added a “Mark Complete” feature to know which articles you've read and track your progress. Ready to start mastering your craft? Sign up free here! Want to learn more? Check out some of our exclusive content below. We love empowering WordPress professionals like you with in-depth, highly researched, professionally curated content to give you the edge over your competition and grow your business. But there are hundreds of articles on this site and it can be hard to keep track of which articles you've read and which articles you haven't. So, we're happy to announce that we've launched the Mark Complete feature on every article! Use it to mark the articles you've read as complete and see your progress. To mark an article complete, demonstrate your mastery of the content by sharing your thoughts in the comment section below the article. After leaving comment a comment the “Mark Complete” button will be available below each article. The Mark Complete button below each article. After marking an article complete, it will show as complete in the parent section with a green check mark to the right of the article. Articles listed on the Section page with the Mark Complete indicator to the right. What do you think of our new Mark Complete feature? Is it helpful? What could we do to make it even better? Let us know here. ProfitPress has thousands of articles to help WordPress professionals like you make more money with WordPress. But digging through these articles is tedious and unproductive, especially when you're focused on building a particular skill or learning to take advantage of a new opportunity. To help, we've organized our hand-curated content into educational tracks by area of interest to help you master your craft. Each track is also broken down further into sections as shown below. A screenshot of the Freelancer & Agency track. 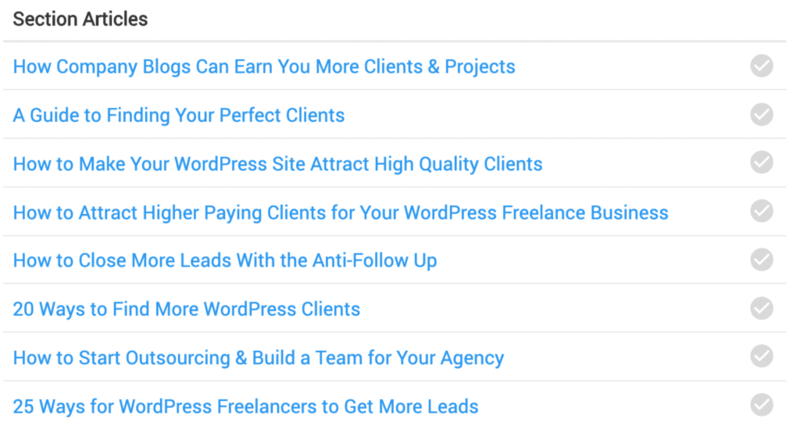 A screenshot of the “Get More Clients” section within the “Freelancers & Agencies” track. To get started, pick a track below and start learning! What do you think of our new educational tracks? Are they helpful? What could we do to make it even better? Let us know here. This guide is for picking domain names for you own business website, a client's website or for any project that needs a domain name. Being a WordPress consultant can be very rewarding and have some major benefits. But there are a few traps you can easily fall into when you first start out. Here are some of the lessons I learned in the first 8 years of my WordPress business. Marketing is a tough sell especially when some businesses don’t understand how important it actually is. So what happens when you sell marketing as a product? I think we can all agree that one of the most stressful things about having your own business is bringing in new clients. Have you ever wondered how others are doing it and seem to be doing so well at it? We did too! So, we took a poll within our WP Elevation Facebook community to find out how our members are bringing in new business. Launching a WordPress maintenance service is a great way to add a reliable revenue stream to your freelance business. And ManageWP can be there every step of the way. One user shows us how he accomplished it so you can, too. Refunds are a reality for every business; small, large, and in-between. But what happens when your business sells digital products that can't be returned? This week in The Weekly EDDit we explore the unique nature of refunds for digital products. Every business is hard. My friends who run the coffee shop work long hours, but they love their job. My office building neighbor runs a lawn care service, and he works hard as well. What is satisfying is the reward you get for building a business. A WordPress site care business is the same. So, if you think you want to start a site care business, ask your self these seven questions. Do you sell it via your website with a tool like Freemius? Do you sell it via a marketplace like Envato? Do you offer a freemium version through the WordPress repository? In this interview Vitalii shares his path to success using Freemius. Your plugin’s sales aren’t going to just skyrocket on their own, so as a company that’s focused on helping WordPress product developers explode their sales – we decided it was time to publish an action-oriented business book that focuses on the business and entrepreneurial side of developing and selling WordPress plugins. In this post I share the email marketing automation technique we’ve come up with, using tools that are available for everyone. I’ll provide an inside look into our thought process of why we did it, how to set it up from A to Z, as well as try to answer the question – how has it been working for us? The most important thing about this question is knowing when to ask it. Most small businesses are masters of their craft, not website experts. That's why 95% of small businesses have outdated websites. That's also a big opportunity for WordPress professionals to help out. There was a recent article by Smashing Magazine that detailed how web agencies like mine need to step it up and offer more value than just building a website. It’s a misnomer that many of us find difficult to penetrate. The idea that our livelihood is going away because of websites like Squarespace, Weebly, WordPress.com or Wix, is not accurate. Small businesses often struggle to find new people who are interested in their product or service. Other than paying to be seen by potential clients, such as with pay-per-click ads, how else can a small business compete? That's exactly where organic lead generation comes into play. Welcome to Entrepreneurs On Fire monthly income reports! We pull back the curtain and reveal the earnings and expenses of all things Entrepreneurs On Fire related. The goal of these reports is for fellow Entrepreneurs to emulate our successes and avoid our failures, and as you will see, there are plenty of both. Wouldn’t it be nice if a WordPress site could be something more than just the digital face of one’s brand? That’s why you develop websites in the first place–to help companies do more with their digital presence. In other words, to generate more leads and conversions for their business. But is that enough? Is the revenue that comes from direct efforts to sell a service or product on the site the only thing you should be focused on? About twenty months ago, while sitting on a couch in Auckland, New Zealand, my team and I flipped the switch to enable automatic renewals for AffiliateWP. Two months later we did the same thing for Easy Digital Downloads and Restrict Content Pro. This was a move that we had been working towards for nearly a year and it's one that we believed would fundamentally change the position of the company over the next one to two years. Now that it has been twenty months, maybe we can answer the question: were we right? Did it make a significant impact for us or was it all futile hopes? When your plugin or theme business reaches a certain maturity, inevitably, you start to explore additional revenue streams. One trendy channel is affiliation. Setting up an Affiliate Program can be a powerful, long-term investment that will make you money, power up your SEO, and improve your brand awareness. Alternatively, if planned or executed incorrectly – become a huge waste of time and money, so it's important to do it right. There are many digital products out there. To sell, you'll need to market yours. Patrick Rauland shares how he codes & promotes his products simultaneously. Phil Derksen has plenty of experience selling a WordPress product business. Here, he shares what the process looked like with his most recent acquisition. Search engine optimization (SEO) is what increases your chances of being found when customers search for a product or service like yours with Google, Bing, and other search engines. If a customer is using a search engine to find what they need and you don't show up, you don't exist. As you grow in your career as a software developer, a natural next step is to jump into independent consulting. You have greater control of your time, can make more money , and have the freedom to pick and choose the projects that you work on. If you’ve been in the game for a while, feel free to skip to the second post when it becomes available. No matter what stage your business is in, improved financial record-keeping and great habits can save you time and stress while opening the door for growth. How do you monetize a WordPress site? How can you create a full-time income from a web entity? There are many ways to monetize a WordPress site: Advertisement, e-commerce, sponsored posts, membership sites and more. Learn about them all here. “You can watch the money roll in without lifting a finger.” “Kick back on the beach as your profits soar.” “Wouldn’t you like to make a living while on vacation?” You’ve likely heard all of these pitches before. If you’re involved in the online business world at all, odds are good you have. Let's talk realistically about how to do it. I didn’t get to where I am overnight. It’s been a long road filled with lots of hustle and my fair share of mistakes. And yet, through persistence and passion, I’ve managed to build something amazing—something I never thought possible when I first launched SPI. To build a winning marketing page that will drive installs, writing good copy is not enough. You need to take this further and optimize your marketing page with elements that leave an impression and drive conversions. Learn how to enrich your WordPress plugin marketing page with GIF animations boost your installs. This marketing research discusses the importance of Black Friday & Cyber Monday, specifically for WordPress plugins & theme sellers. My goal is to bring forth data to show why not doing anything to increase sales during BFCM means leaving a LOT of money on the table, plain & simple. On December 14, 2016, my team and I pushed a significant change to our Easy Digital Downloads products: we increased the price on all extensions by 50-250%. Yes, you read that right: up to a 250% price increase on certain plugins. This change was done for a number of reasons, which I will get into shortly, and has resulted in a very interesting last three months. Since I have always been very open with my company's financials, I would like to now share some reflections on the change that we made and to also share some of the aftermath of the change. Half of small businesses still don't have websites. Why? 41% of these businesses without websites say their business “does not need a website.” This is a dismissal, not a reason. WordPress and WordPress professionals are the answer to make it cheaper and easier. As a WordPress professional it's our duty (and our opportunity) to bring more businesses online for the first time and help them thrive. Should WordPress Freelancers Show Rates & Pricing on Their Website? The decision of whether or not to use pricing pages on your freelance website is entirely personal. Here's how to decide if you should publically share pricing. Automation can be a scary word for some, especially when a business relies on being able to make a personal connection with clients or customers. When it comes to working in WordPress, however, we understand that automation is a good thing (up to a certain point anyway). While we obviously don’t want a bot writing a bunch of gobbledygook for our blogs, we do want to streamline our workflows when it makes sense to do so. Nowadays many people have found ways to make tons of money with WordPress. There are many different ways by which you can also earn a living online with it. Have you ever thought of making money using WordPress? If yes, this detailed post is a treat for you where I will be discussing 8 proven ways to make money with WordPress. Ready to strike out and start your own business? If you have experience working with the world’s most popular content management system, you may want to consider exploring new ways you can make money with WordPress. In all of the Interwebs, WordPress plays a key role. It can lay claim to 60+ million websites, 65 percent of the CMS-powered websites market share and a vast community of enthusiast developers, designers, and advocates. Because of this, it should be your choice to start an online business, whether it’d be about selling products or providing custom services. So, how can you earn money with WordPress? Are you looking for the top ways to make money online that are NOT scams? WordPress is the largest publishing platform on the planet, and it powers over 30% of all websites. These aren't “get rich quick schemes.” If you're willing to put in the effort, here are 25 legitimate ways to make money online blogging with WordPress. Envato’s ThemeForest and CodeCanyon are de-facto the leading marketplaces for WordPress plugins and themes. With a growing community of over 7 million subscribers, both marketplaces sound like a lucrative place to start selling your digital products. Are they right for your WordPress business? Selling your premium WordPress plugins on CodeCanyon? Is this marketplace the best option in terms of revenue? We dug deep in their numbers to find out. Co-founder of MotoPress, Alexander Mat, shares his company’s biggest challenges in today’s saturated and Guten-stirred WordPress products’ market. MotoPress has been a successful WordPress business creating sustainable plugins & themes for small & midsize businesses, so it is interesting to get Alex’s take. The most important part of staying at the top of your game as a WordPress professional is keeping up with the latest learnings, techniques and opportunities. Unfortunately, you don't have hours a week to scour the web for the latest articles to help you master your craft. But you're in luck, because we do! 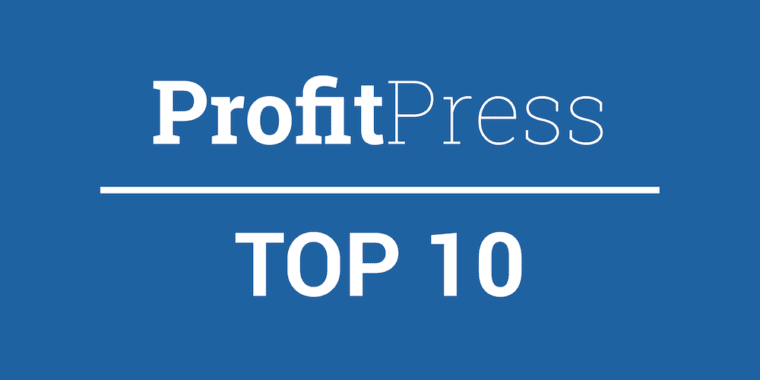 We're happy to announce the launch of the ProfitPress Top 10, a hand-curated roundup of the most valuable articles that we could find to help you make more money online with WordPress. Expect a new issue of the ProfitPress Top 10 every other week. Check out Issue #1 here. 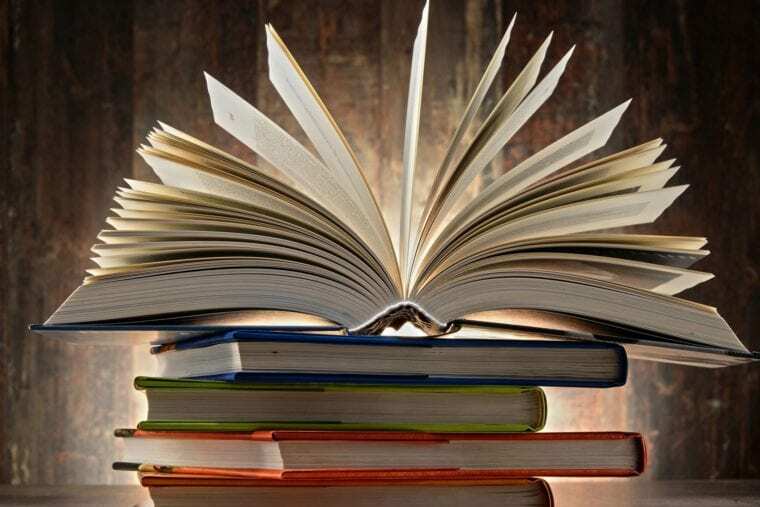 WordPress Codex Glossary: This document is designed to offer definitions of various terms, exclusive to WordPress, that users may not be familiar with. WordPress Jargon Glossary: It’s easy to forget that in WordPress we use a lot of jargon, so the Marketing Team has created this document. There's even a handy PDF version. Make WordPress Core Glossary: The glossary from the Make.WordPress.Core contributor handbook. WordPress Glossary Terms for Beginners (by WP Beginner): Are you puzzled by strange WordPress terms or abbreviations? Are you looking for a WordPress dictionary that explains these WordPress terms in plain English? Then this is for you. Whenever you find a term you don't understand while working with WordPress, chances are the definition is in one of these glossaries. Happy WordPressing! We're happy to announce that we've launched our job sites directory. It focuses specifically on WordPress jobs and Remote jobs (non-WordPress specific). Rather than including actual job listings, we opted to aggregrate the top sites for WordPress and Remote jobs. The Post Status Job Board is the best way to get a job in front of serious WordPress professionals. Likewise, it’s the best way for serious WordPress professionals to find qualified, full-time positions at great companies. All jobs submitted to Post Status go through a review process with our editorial team, where we qualify the employer and position available; then we do our best to help accurately express the position to our audience, so that both applicant and employer know as much about one another as possible before the interview starts. Then, it’s up to you. Explore Post Status and other WordPress job sites on our jobs page. We were surprised how many remote job sites there were–there are over 100 remote job sites on our list! Some serving all remote jobs, some were specific to programming language, geography and more. Other sites focused on specialties like customer support, design, etc. Explore them all here. We hope these job resources are helpful, If you have any corrections or additions let us know on our contact page. Click the button below to go to our jobs page. We first launched ProfitPress in 2013 as a program to help WordPress freelancers make extra money by better monetizing low-value clients. It was an interesting concept and fun to build, but the model ultimately proved unsuccessful. Over the last few months we've been revamping ProfitPress with an improved mission and approach. We help WordPress professionals make more money. We believe in empowering WordPress professionals like you. You’re an artisan, an expert & a master of your craft. You should be doing your best work, not wasting hours trying to stay at the top of your game. We empower professionals just like you by delivering an in-depth, highly researched, professionally curated content to give you the edge over your competition & grow your business. Let us help you build a business as great as your ambitions. We're broadening our approach to help all WordPress professionals: freelancers, agencies, plugin/theme developers, bloggers and anyone else who makes money with WordPress. WordPress powers 1/3 of all websites–it's powerful, versatile software and WordPress professionals wield that power. But most WordPress professionals lack the knowledge to fully leverage that power–it's a different skill set. ProfitPress closes that gap to help WordPress professionals understand their unique strengths & discover how to start making extra money. By extension, we're also helping aspiring WordPress professionals–individuals who want to earn more money and see WordPress as a path to getting there. Our new approach is to build a valuable WordPress resource over the next 5 years through content curation, writing in-depth guides, exploring new business models, sharing where other WordPress professionals are finding success and more. We'll also experiment with new plugins, frameworks and more. We'll share these learnings in structured, easily searchable way (we've been experimenting with Algolia and it's awesome). Newsletter: Carefully selected articles to help you start earning more with WordPress. See our first newsletter here. Jobs: A list of 100+ job resources for WordPress and Remote (non-WordPress specific) jobs. Articles: A browsable, hand-curated collection of the best articles from around the web to help you earn more with WordPress. Guides: In-depth guides on ways to make more money with WordPress. See our guides here. 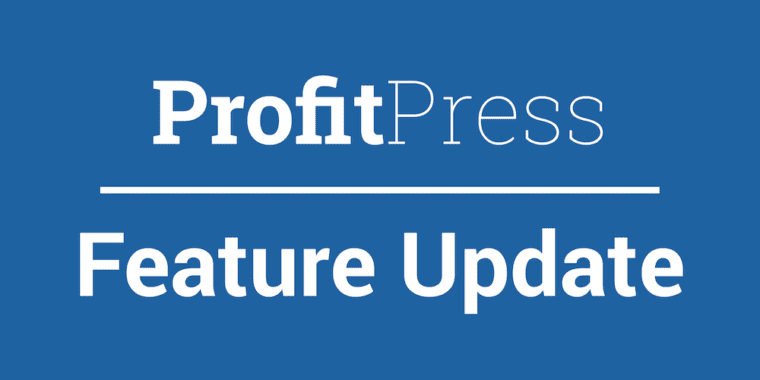 Blog: News and updates on ProfitPress, including our roundups. All resources are free. We want ProfitPress to be sustainable, so we'll look into monetizing with affiliate links, premium guides, memberships, etc. in the future. We're just building our content library, so expect our limited content to steadily grow as we add new material. Thanks and here's to earning more with WordPress!